Learning the Japanese alphabet as a complete beginner can be a bit intimidating. Not only is it a whole new language, there are three different alphabets! While this may seem challenging at first, the good thing is that when you take it in steps, it becomes much easier to master. The first of these steps right off the bat should be mastering hiragana, and this post will show you how. Hiragana is the most basic of the three alphabets, and the foundation of the written Japanese language. It’s the first one children in Japan learn, just like we learn our ABC’s. There are 46 characters, each representing a certain sound, and are pretty simple in shape. If a little kid can pick it up, then so can you! Let’s learn a little more about how this alphabet works. Though we call it an alphabet, if you want to get technical, hiragana is actually a phonetic syllabary. That means that unlike a conventional alphabet, in which each letter represents a specific individual sound in the form of consonants and vowels (a, b, c, etc. ), a phonetic syllabary such as hiragana uses symbols which represents a whole syllable. Furigana is basically a pronunciation guide to difficult Japanese words, written as small hiragana characters above or beside kanji characters. Kanji are the complex Chinese characters that represent full words and are most commonly used in texts. If you can’t read kanji, there will most likely be furigana right there to help. 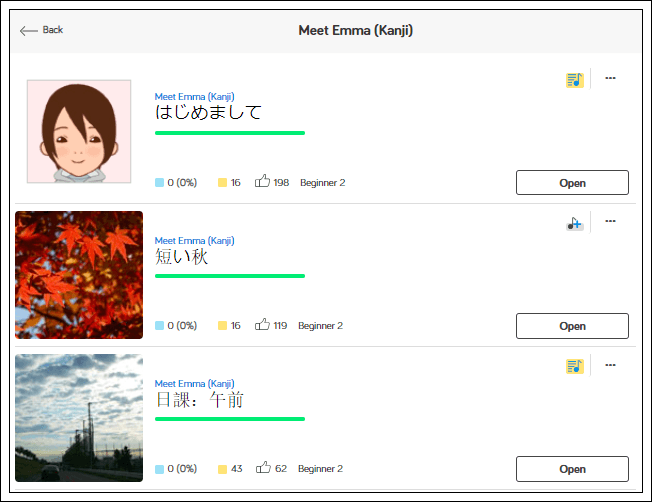 LingQ comes equipped with furigana. Particles are an important part of Japanese grammar. They are added at the end of a word and indicate whether it is a subject, object, or verb of a sentence. The most commonly seen are は (wa), が (ga), and を (wo). This is also important to understand the flow of written sentences since words are not separated by spaces. 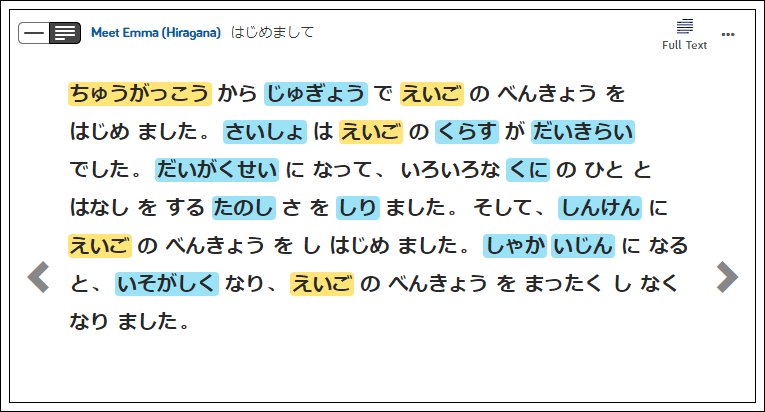 Particle placements and grammatical hiragana (below) are good indicators of where a word ends. The good news is, because the characters are so simple, it’s easy to learn in as little as a few days with proper practice and dedication. The first thing you will need is a good hiragana chart, which you can find pretty easily with a quick internet search. Begin by learning the vowel sounds, and then practice row by row, focusing on only one set at a time. English is made up of consonants and vowels. Hiragana is structured a little more differently, where the characters are grouped in a table format according to the sounds they represent. The table is called the Gojuon-zu, which literally means ’50 sounds chart.’ Rows share a common first consonant, and columns share a common vowel sound. The first row of this chart are the vowel sounds, あ (a), い (i), う (u), え (e),お (o). These vowel sounds set the order for the letters in all following rows, which is organized according to their consonant and vowel sounds, in which the letters in a row all begin with the same consonant sound, and the letters in the same column share the same vowel sound. There are generally five letters per row (with the exception of the Y and W row). Now that we understand the structure of the table, lets learn more about the pronunciation! As mentioned above, having a chart on hand and understanding the structure is extremely helpful to study from. But for the sake of this lesson, and to delve into the sounds more clearly with concrete examples, we are going to break it down into groups, followed by the closest example of an English word with the same pronunciation. Please note that the English words may not necessary have the same spelling as the sound they represent. Just focus on the sound of the vowel in the word. In English, we learn our vowels in the following order: A, E, I, O, U. In Japanese, the order is a little different – A, I, U, E, O – as is the pronunciation (ah, ee, oo, eh, oh). As you learn the rest of the letters, remember that they will all keep this same vowel pronunciation throughout the chart. There are no variables in sound when it comes to vowels. Once you can pronounce these, you can pronounce any character! Let’s move on to full syllables with consonant sounds now. *Note: There is no ‘si’ sound in native Japanese. *Note: There is no ‘ti’ or ‘tu’ sound in native Japanese. は– ‘ha’ as in ‘ha ha ha!’ (laughing). *Note: There is no ‘yi,’ ‘yu,’ or ‘ye’ sound native to the Japanese language, and are only found in foreign words and indicated in katakana. *Note: There are no sounds for ‘wi,’ ‘wu,’ or ‘we’ native to Japanese. *を has the same exact pronunciation as お, and is only used as a particle. You will never see this letter used in a regular word, that is what お is for. *Note: This is the only Japanese letter without a vowel sound in it. It sounds just like an English ‘n,’ but can sometimes sound like an ‘m’ in certain combinations. A dakuon is a more strongly voiced sound that begin with the following syllables: k, s, t, and h. These and are indicated by two small strokes that look like a quotation mark in the upper right of the letter. These are not seen in the hiragana chart because they are based on the letters of the k, s, t, and h rows, and are formed by simply adding the indicator to the top right corner of that letter. *Note that the pronunciation of じ and ぢ (ji) are the same, while ず (zu) and づ (dzu) are very similar, with the z in dzu just sounding a little stronger. Handakuon is the ‘H’ row with a small circle added to the top right. It is pronounced as the ‘P’ sound. There are many cases in which a small hiragana letter is used in combination with a regular letter to produce a sound that is not on the basic chart. Yoon (pronounced yo-on) are combination sounds that use a normal hiragana letter followed by a small ‘ya,’ ‘yu,’ or ‘yo.’ When this small letter is used, it basically cancels out the vowel sound of the preceding hiragana, and combines only the consonant part of the sound with the following small letter. Note that in these cases, the preceding larger hiragana is usually the ‘i’ form of the letter (ki, gi, ji), as mentioned above. A sokuon is a stop between two syllables. This usually results in the syllable preceding the つ to carry greater emphasis. Ready to Start Studying the Japanese Alphabet? I hope this lesson has opened your eyes to the world of hiragana, and the surprising ease at which you can learn it. Even though it may look like a lot at first, you will soon find that with the pattern of he sounds and simplicity of the strokes, it becomes quite simple. Finding beginner content isn’t the easiest thing to do, luckily, LingQ comes equipped with courses that are great for beginners. These courses contain lessons that are in hiragana and allow you to look up words easily as well as listen to the lesson’s accompanying audio to give you a better understanding as to how words are pronounced. LingQ is also available on mobile, so you can take your lessons anywhere. Hiragana can be learned fairly quickly, but it is up to you! Please make sure to dedicate some time to practice daily, including studying the chart, practicing writing with practice sheets, and of course, reading aloud to practice both recognition and pronunciation. Once you’ve mastered hiragana, you’ll be able to move onto katakana and kanji. For more information on reading in Japanese, check out Learning to Read Japanese: A Quick Guide for Beginners.